Back in February, OCZ Technology (OCZ) did a secondary at $9 to raise $110M. The company had recently faced low cash balances so analysts and investors a like were concerned about the need to raise funds. The company was always clear about the need to raise major funds would only occur if it signed a major customer. Fast forward to the Q412 earnings report last night and the company guided to nearly $700M in revenue for fiscal 2013 compared to estimates around $513M. Based on that, one would think the stock has now soared way beyond the secondary price. Well that person would be mistaken. The stock has now plunged 50% from the highs around $10 shortly after the secondary while all but confirming a deal with the much speculated Facebook (FB). The company clearly stated in the conference call that it had a deal with a leading social media company not to mention numerous other data center customers. No to mention that Yahoo (YHOO) had forecasted a 3x increase in spending. So what gives? Why would the stock plunge in the face of overwhelming demand? Why does it now trade at .5x forecasted sales? Forecasts that the company repeated over and over were too conservative. Almost to the point the company was acknowledging that the market couldn't handle the real forecast so $700M was provided as the upper end. Yes anybody doing the math would realize that amounts to 100% growth for a company trading for peanuts. In situations like this it is almost impossible to determine when the market catches on to reality. 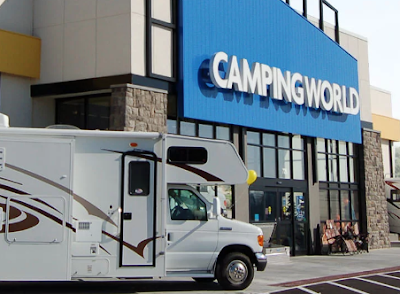 Sure the company reported lower earnings than expected, but the company had recently announced higher expenses for the last quarter. The Vertex 4 was pushed forward moving expenses into Q4. Big deal! Of course, a risk exists that the company won't reach the revenue targets and especially the margins after missing them last quarter. Did investors really want them to turn down FaceBook? Come on people, quit playing this game where we'll pretend ignorance. OCZ saw a huge opportunity in the SSD market so it ramped up operating expenses in order to capture the market. Now that it has become a dominant player it can focus more on margins. The absurdity that it should have ignored major growth for short term profits is beyond comprehension. Somehow this always works for Amazon (AMZN) but OCZ investors don't like it. 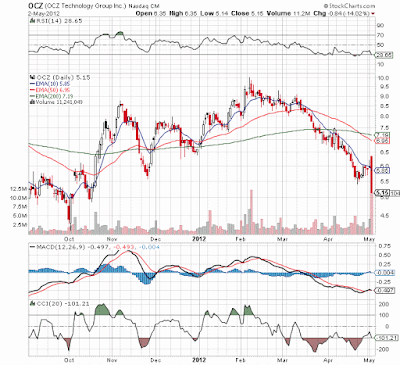 My models are very invested in OCZ, but it is tempting to look for another entry point. Competitor Fusion-io (FIO) trades at nearly 10x the valuation now with a much smaller revenue base. This disconnect won't last much longer. Fiscal year 2012, net revenue increased 92% to $365.8 million compared with fiscal year 2011 net revenue of $190.1 million. Net revenue in Q4'12 was a record $110.4 million, and increased 71% compared with net revenue of $64.6 million reported in Q4'11. Fiscal year 2012, SSD revenue was $338.9 million, up 154% compared with $133.2 million in fiscal year 2011. Q4'12 SSD revenue reached a record $103.2 million; an increase of 77% compared with Q4'11 SSD revenue of $58.2 million. Fiscal year 2012 gross margins increased to 22.5% compared to 12.7% with fiscal year 2011. Q4'12 gross margin increased to 25.0% compared with 16.6% in Q4'11, and 22.5% in Q3'12. Net loss for Q4'12 was $10.9 million or $0.19 loss per share compared with a net loss of $9.3 million or $0.27 loss per share in Q4'11. Non-GAAP net loss for Q4'12 was $6.0 million or $0.11 loss per share as compared with a non-GAAP net loss for Q4'11 of $0.8 million or $0.02 loss per share. Chart looks ugly but the stock runs into major support from back in October just below these levels.